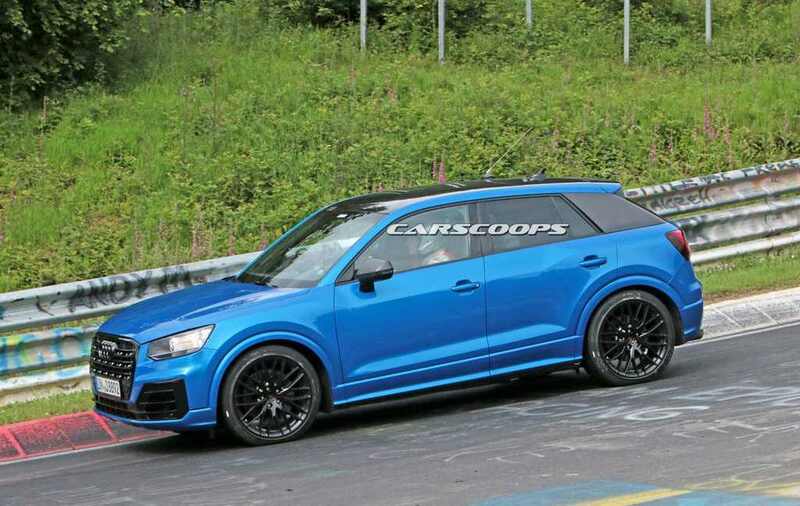 Rumours of the existence of the hotter Audi SQ2 had already been surfaced on the internet and the model itself was spied doing rounds around the Nurburgring as early as July 2016. The undisguised test mule gave us a clear indication of how the production model will look like as the launch timeline is reportedly sometime later this year. It is worth noting that the standard Q2 ia available in several international markets and is expected to enter India as well. Like any other ‘S’ models in Audi’s range, the SQ2 will flaunt powerful engine and sporty design package. The standard model is the brainchild of the German car manufacturer’s decision to create an SUV appealing to the premium crowd and it has done so with perfection so far. A new base segment is indeed brewing in India with the upcoming Q2 going up against likely arrivals like BMW X2 and the Volvo XC40 as automakers look to address more entry-level customers in the luxury space. The spy pictures clearly illustrate the presence of an aggressive quad exhaust system, sporty front grille finished in black, prominent black bumper and a rear diffuser. Edges of the front grille, four rings logo, roofline, wing mirrors and the pillars have all received black treatment to elevate the overall appeal of the SQ2 from the standard model. 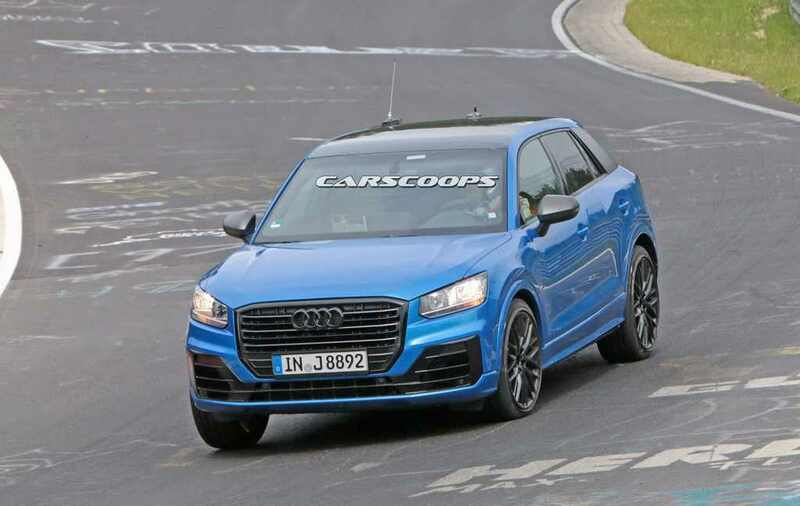 This performance-based take on the Q2 will be fitted with a turbocharged engine taken from the Audi S3 Sportback sold globally. The 2.0-litre, four-cylinder, turbo motor is good enough to generate a maximum power of 310 hp. Its proportions size and performance level will slot it right against the likes of the Volkswagen T-Roc R.
It may adapt a 2.0-litre turbocharged engine sourced from Golf R and make 306 hp and use a seven-speed dual-clutch automatic gearbox to channel power to all four wheels. In case of the Audi SQ2 though, the power will be transferred to all four-wheels through the proven Quattro AWD system. 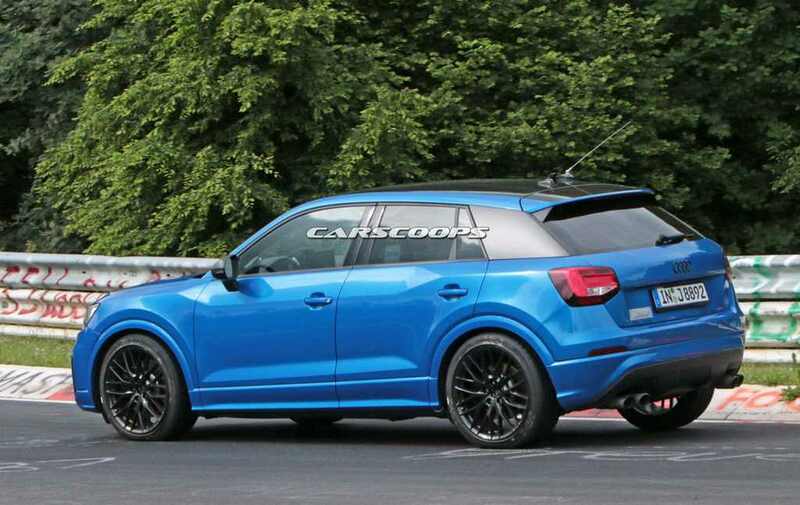 It will feature along the SQ5 and SQ7 in the expanding SQ range. Audi has admitted that it will be easy to incorporate the new turbo unit in the MQB platform as it shares plenty of components with the A3. Audi seems to be well-ahead of the hot version’s development but the surprise is that it won’t be the range-topping model. An even go-faster version dubbed as RS Q2 is reported to be on the cards and is likely to feature the 2.5-litre five-cylinder motor derived from the RS3 Sportback to help generate more than 362 hp. It will likely compete against the Mercedes-AMG GLA 45 in India.